Read our full kitchen cabinet guide here which lists out all types of kitchen cabinets with photo examples. Read our article setting out 21 different types of kitchen pantries (with photo examples). If you have the space and budget, a pantry room can be a huge storage convenience because it can be a room with nothing but shelving. However, most kitchens don’t have a pantry room; instead pantries are tall standing cabinets with doors. If you’re really fortunate, your kitchen with have both types. If it has a door, think through the door’s arc and how it will encroach on your kitchen or inside the pantry. Alternatively you can use a sliding door. Will the design match the kitchen or will you decide to save money and use less expensive materials? Will it serve purposes other than being storage. Research custom storage options – racks, organizers, etc. There are more options than just shelves for creating a more efficient storage room. See our gallery of walk-in kitchen pantry ideas here. Many kitchen islands create more counter space and more storage space. They really are a terrific way to enhance a kitchen as long as sound kitchen island design is used. Storage islands can be viewed as a large cabinet. Some include drawers and cabinets. It’s a large item to design. Read our extensive guide setting out 54 types of kitchen islands here. Discover 26 types of kitchen pot racks here. 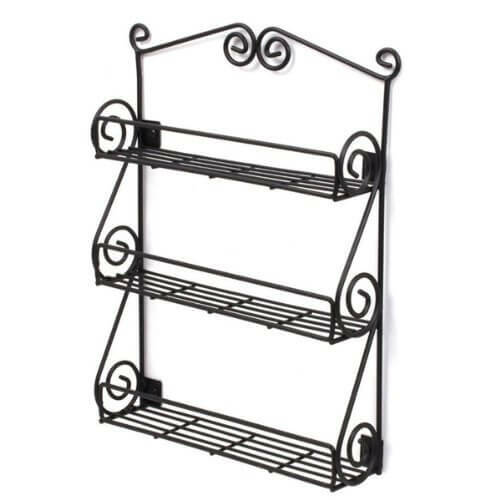 This standard wall-mounted pot rack allows you to hang your skillets from the hooks, while stacking your larger stock pots and pans on the shelf. 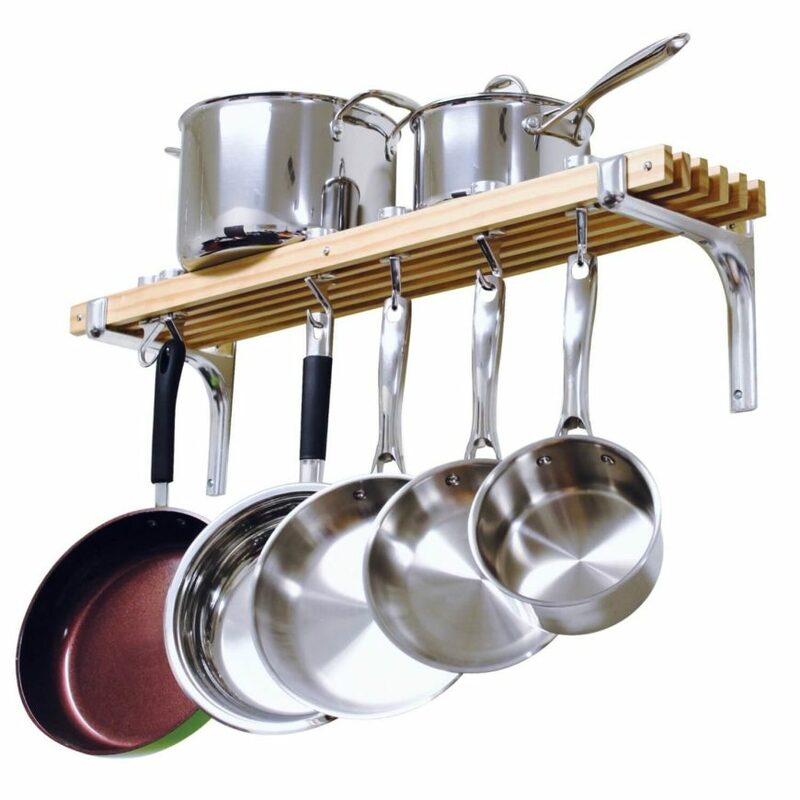 This stainless-steel rack features a center grid so you can re-arrange the hooks to suit your needs. If you’re still running out of space, try adding extra shelving to an open wall in your kitchen. Whether it’s floating shelving or something a little more space-consuming, shelving is an awesome way to add storage to a kitchen. The rich, polished wood and wrought-iron skeleton are perfect for a space between a kitchen and a dining room, tucked neatly into a corner. A baker’s rack will fit into your design wherever you have space for it, and the extra storage and counter space you get by owning one is hard to beat. They’re also really easy to install and move around. Bakers rack for the kitchen. Open shelves are a great option because they cost much less than traditional cabinets and look great. 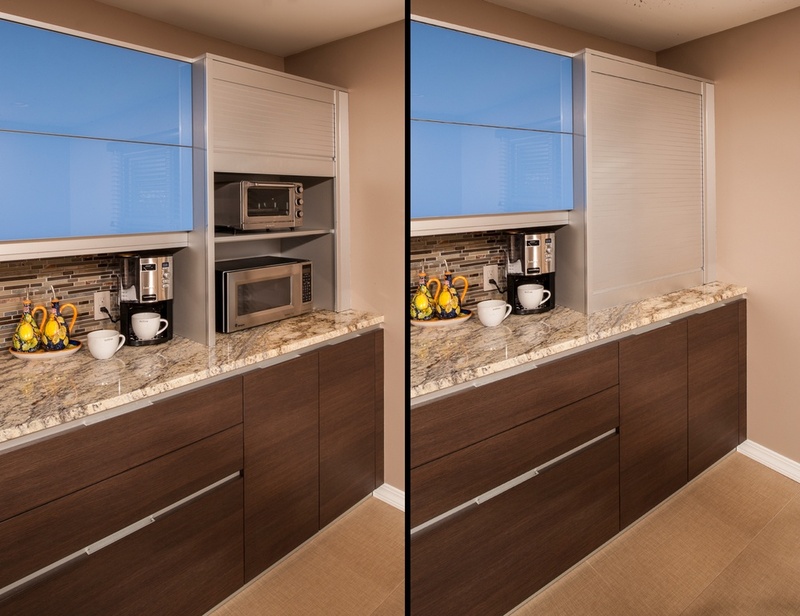 Here’s an example of a loft kitchen that dramatically increased kitchen storage capacity with open shelves. 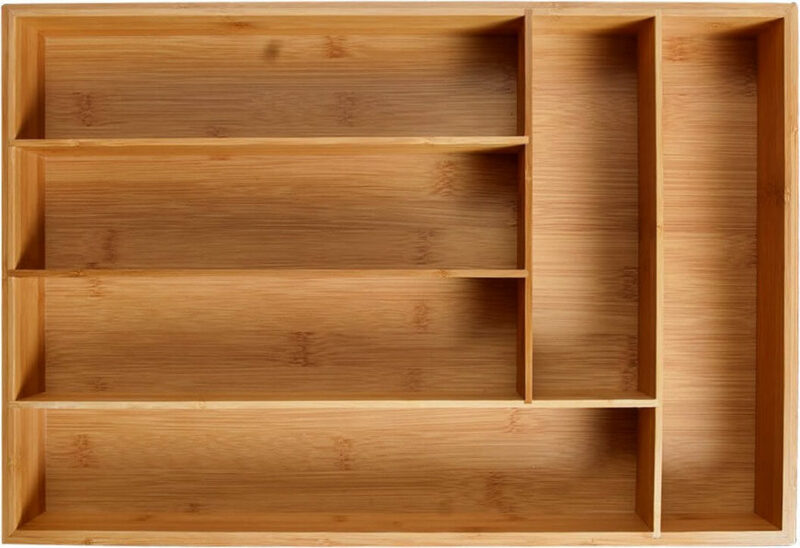 If you have wall space available, you can easily and inexpensively add floating shelves such as the following. 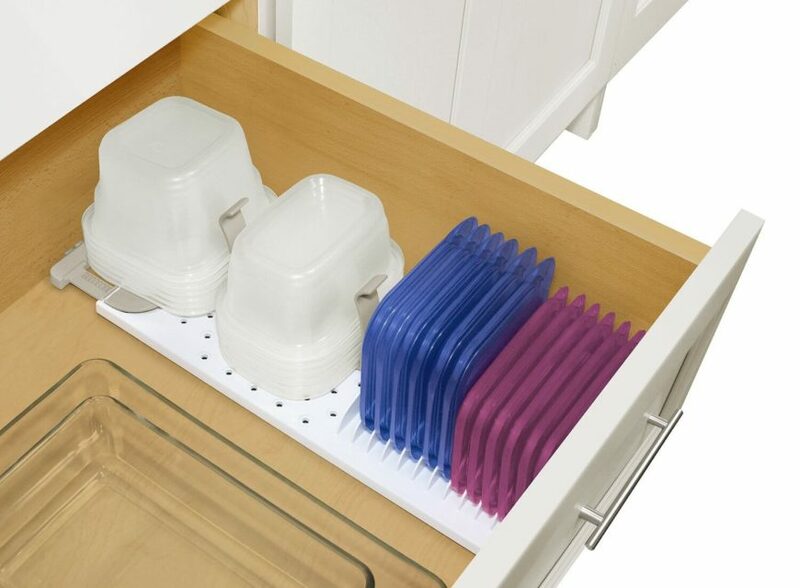 Read our full guide on utensil storage (20 options). Do you have a messy utensil drawer? If you do, you probably have been looking for ways to keep your drawers organized and your utensils exactly where you expect them to be. 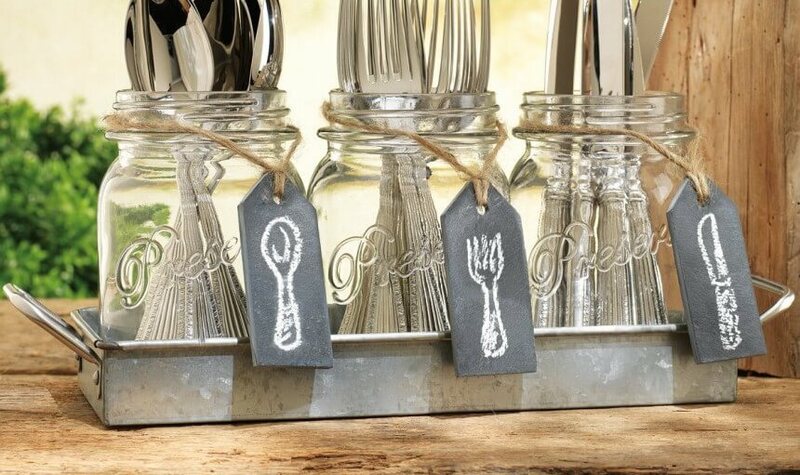 If you’re looking for a neat way to store your silverware, a small tray with mason jars will keep your utensils organized and within easy reach. Or, invest in a simple drawer insert. The dividers will help you keep your spoons with your spoons and your forks with your forks. A sturdy wooden divider ensures that it’ll last for many years to come. Discover many spice storage ideas here. There are a lot of different ways to organize your collection of spices, which could be formidable, depending on how much cooking you do. I know we end up with a lot of exotic spices that we don’t use very often, and it can be frustrating to buy a new container of, say, garlic powder, only to get home and realize you already have two more that were hiding in the back of your cabinet. This wall-mounted version has elegant swirls and three tiers. Perfect if you don’t use too many different spices. The baskets rotate so you can easily remove the spices when you need them. Otherwise, the rack stays compact. We used to stack our dishes so that the dinner plates were below the bread-and-butter plates, but that meant that we were constantly lifting the smaller plates up to take out or put in the dinner plates, which are pretty much in constant circulation. We simply added a small shelf so we could stack smaller plates above the bowls, leaving the dinner plates easier to access. 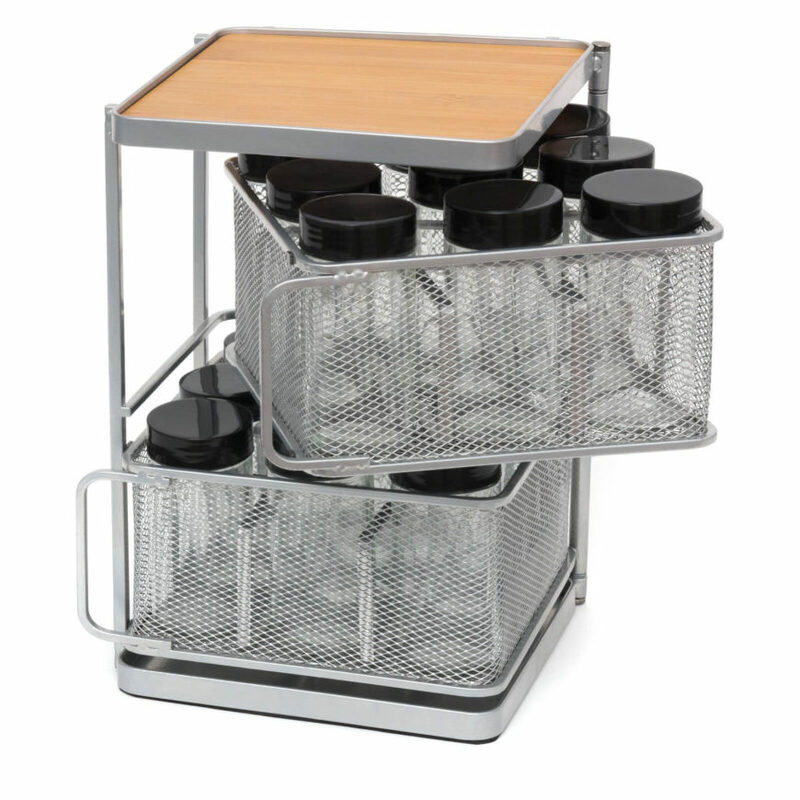 This rack fits neatly into the corner of a cabinet, so you can easily reach your plates and bowls. 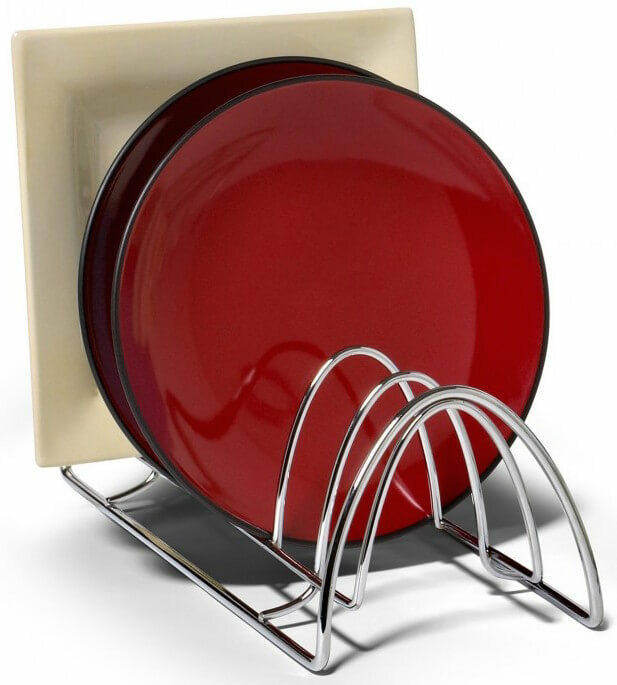 This rack allows you to fit two very different sets of plates in the same space. See 13 types of food container options here. Tupperware is great for storing leftovers or for packing a lunch to take to work, but it can be tough to keep track of all of your lids. We’ve found a few great options to help you make sure you always know where your tupperware lids (and bowls) are. This clever solution has grips to hold your bowls in place, and a spot right next to it to hold the lids. Sometimes simply using one shelf for one type of food just isn’t enough to keep your pantry organized. 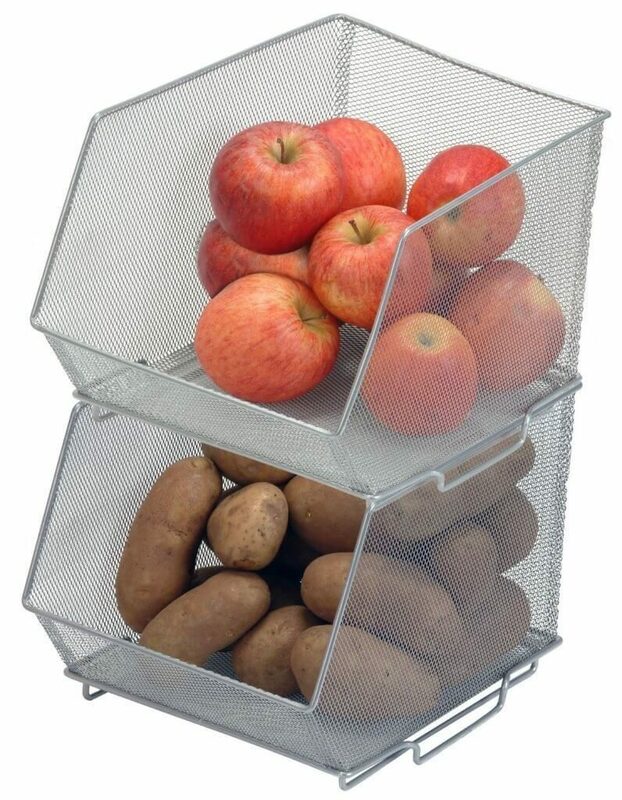 Try installing extra dividers or even boxes and baskets to better utilize the space in your cabinets. 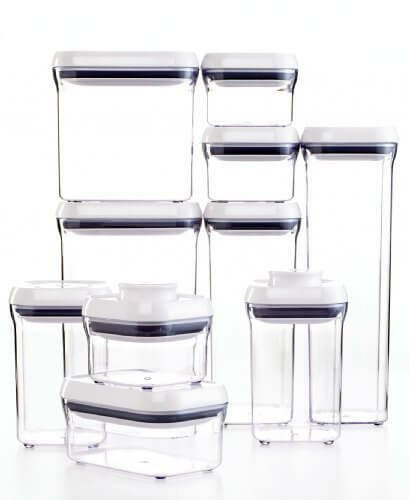 See our extensive food storage guide here. We have a whole lazy-susan full of cans, but many of them are duplicates, and it can be difficult to see exactly what we have. 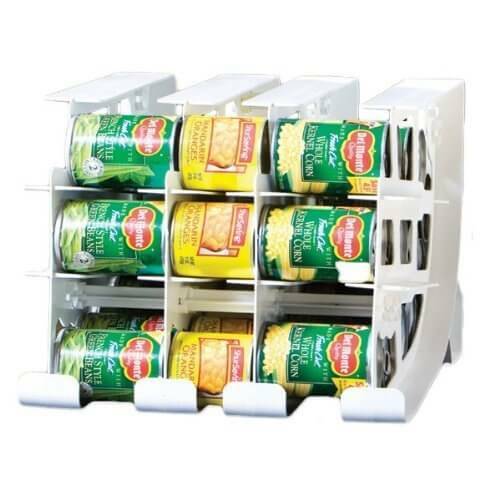 This can holder stacks and displays your cans, so you can see at a glance what you have and what you don’t have. 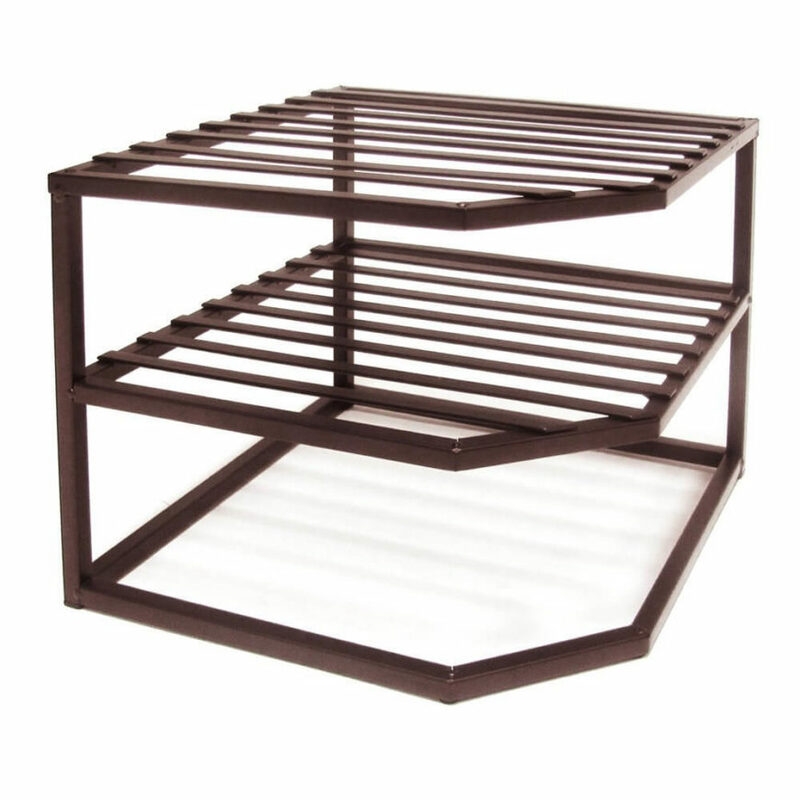 These stackable sections allow you to take advantage of a deep or tall shelf’s vertical space. They come in all sizes and shapes and are easily stackable. Invest in a few for your staples: flour, sugar, and cereals. See our guide setting out 22 wine rack ideas here. There are lots of unique ways to store your wine, including cabinets and shelves, and you should pick whatever fits your budget, the size of your room, and your drinking habits. 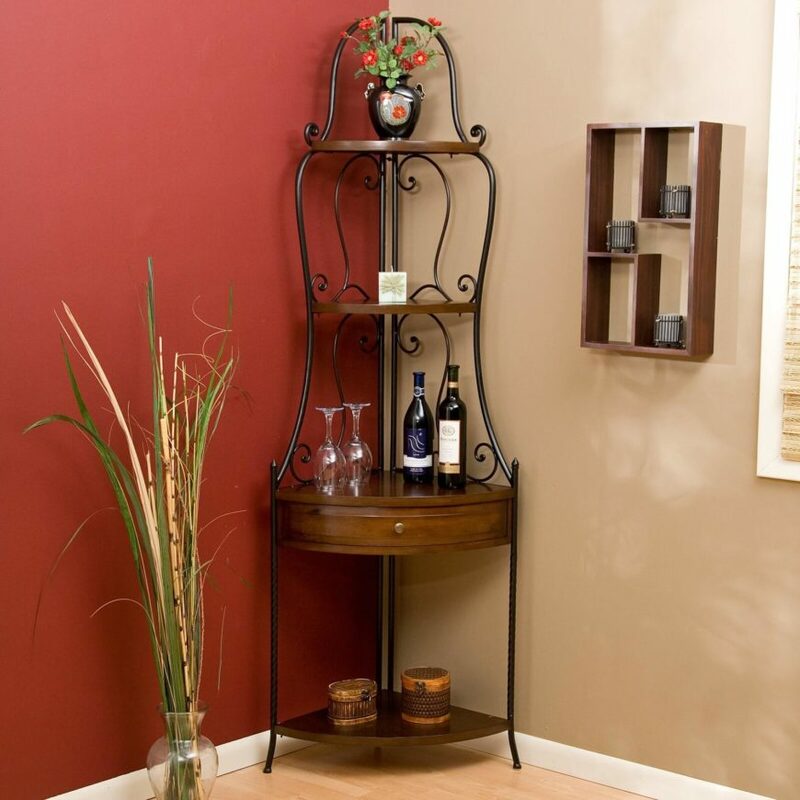 This wine tower can hold up to 18 bottles of wine, and has several shelves above to house wine glasses and decorative accents. 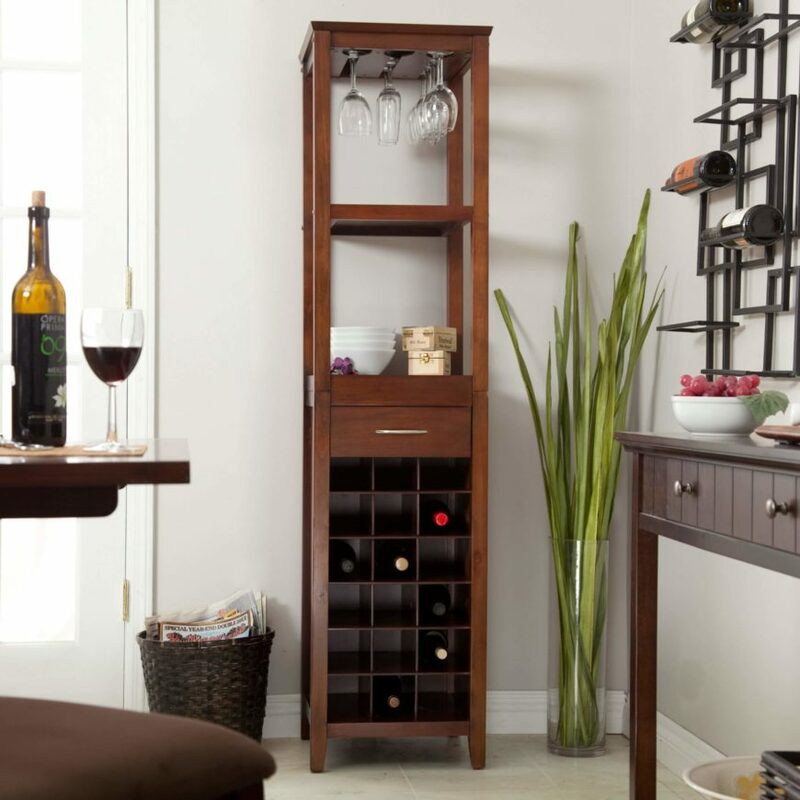 It also holds 18 bottles, but takes up much less room, and can even be placed on top of a wall cabinet if you don’t need to get to your wine very often. 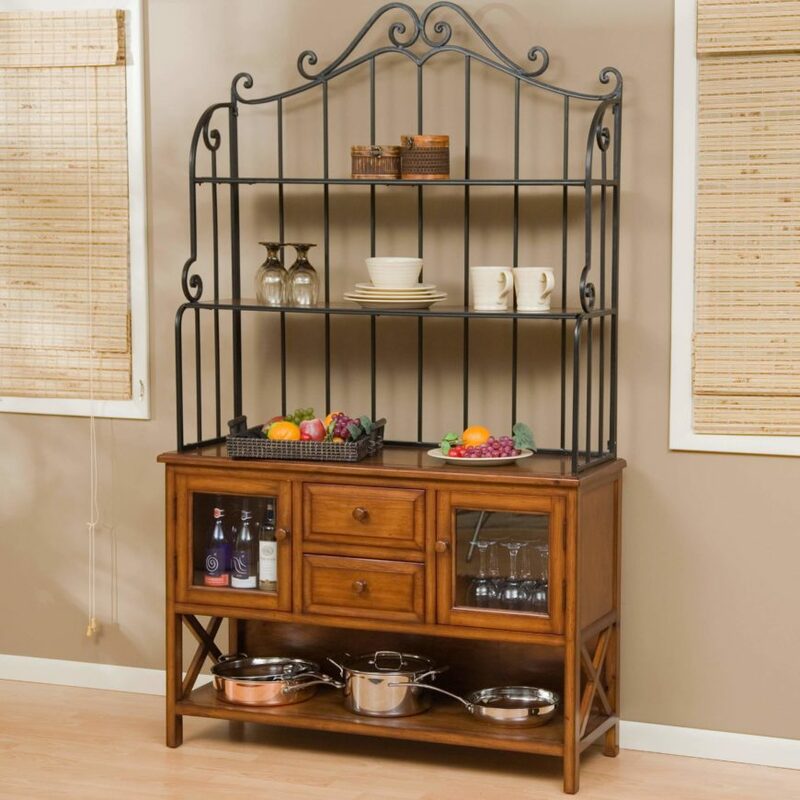 Check out our gallery featuring 22 types of wine racks here. An appliance garage helps declutter your kitchen by stashing away small appliances. Here’s an example. Return to our main home storage ideas page.